Poker would be a zero sum game if it were not for the rake – rake of course being the fee that online poker rooms charge players to play their games. The fees in the poker industry are far from standardized. Many poker rooms sneak in a little raise in rates here or offer a small discount in rake there, all in an effort to boost certain games and stakes or satisfy certain segments of the market. As edges become thinner in the poker world due to the proliferation of knowledge and readily available training materials, the need to find a way to increase your win rate becomes vitally important. One of the most obvious ways is to choose a site that takes the least amount of money out of every pot, the lowest raked poker sites, and thus allows you to use your skill to collect the most money from other players at the table. The challenging part though is figuring out what site takes the least from each pot and how it compares with other sites that are available to you. This website specializes in real money play at US-friendly online poker sites, but please note that several of the seven networks profiled in this report also accept players from all over the world. ProfessionalRakeback.com knows that you'd rather be playing No Limit Hold'em, Pot Limit Omaha, or Pot Limit Omaha/8 poker rather than scouring every possible available poker website or bugging live chat support for information, and thus we are here to help you in that quest with easy-to-decipher rake comparison charts. We have broken down the charts into four groups: micro, small, mid, and high stakes. These tables and charts focus on the US friendly online poker networks: Pai Wang Luo Poker Network, Winning Poker Network, Horizon Gaming Network, Chico Gaming Network, Grand Poker Network, Merge Gaming Network, and Global Poker. When looking at the numbers we are just going to consider the raw data, and will talk about mitigating factors such as bonuses, rakeback and other money-added value considerations after all the charts. Sites are listed from left to right with the sites we recommend most highly, like PaiWangLuo, on the left and the troubled Merge and Global operations on the right. For comparison's sake, PaiWangLuo has 25% more traffic than Winning Network, 55% more than Chico Network, 90% more than Merge Network, 95% more than Horizon Network, and 99% more traffic than Grand Network. For the penny games, $2 buy-ins, the Winning Poker Network offers the only games in town. PWL is pretty good at $5 games although Global is slightly superior at $4: one of the rare stakes in which Global beats most competing sites. Once one gets to the $10 buy in levels, things get a bit more interesting. This is the lowest stakes that Grand Poker Network offers for Hold'em, and, true to the discount nature of their parent company 5Dimes (an A+ rated "reduced juice" sportsbook), the rake is the cheapest of any site on offer. Grand Poker offers the lowest maximum rake caps. In those cases where the capped amount is tied with another site, they offer a lower percentage of rake taken, besting every competitor by at least 10%. This ultimately saves one money on the more frequent small pots, as well as saving one money in the huge pots with lower caps. The only bad news is that GPN is the smallest site in this list and rarely has more than a handful of small stakes games running at any given time. If one is a recreational player, one will probably be just fine with this. However, if one is a multi-tabling 10NL grinder, one will likely need to split one's action among multiple sites or help start games to create more action for oneself. One other note on the Grand Poker Network: It actually does have $0.02/$0.04 games but only for PLO, not NLHE or PLO/8. In these games, it's also the lowest-raked site. In the middle of the pack at $10 tables, there is the Winning Poker Network, which takes an industry-standard 5% in rake but has relatively high rake caps. We should point out though, that $10NL players at heads up tables looking for the lowest rake are well served by the WPN's decision to reduce the rake cap to just $0.20 specifically at HU games. On the high-end of the scale there are the Horizon and Merge networks. Horizon charges the highest percentage rake at 6.67% which will hurt micro-stakes players in the smaller pots. Merge also has high rake at 10NL/10PLO, albeit not as high as Horizon, but its rake caps are atrocious: a full $4 at full tables. These are the levels that one notices things start to get a bit more homogeneous and caps become a much larger part of the equation. The Grand Poker Network really starts to come into its own here, owning the other sites at $25, $50, and $100 buyin blind levels. It bests all comers in both cap amount and rake percentage for almost every configuration of players and stakes in NL poker. We do have to acknowledge an unusual feature of the Horizon Network here though. 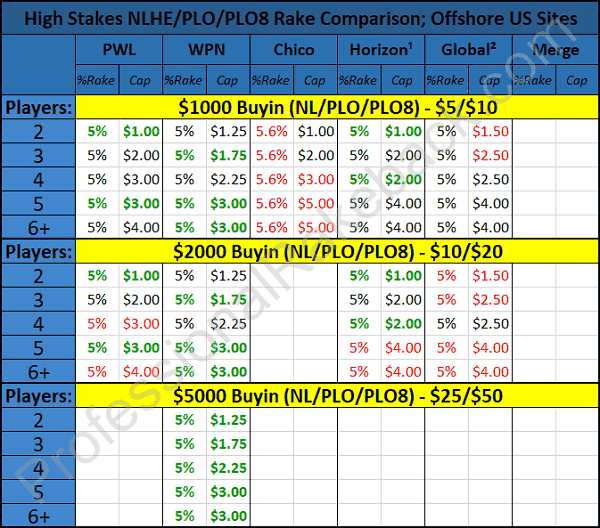 It has some of the best rakes for PLO and PLO Hi-Lo tables at these stakes. This isn't reflected in the chart above because HPN has an entirely separate rake schedule for four-card poker, which you can access here. The rake percent is the normal 5%, but caps are no higher than $1, which beats even Grand Poker. The WPN is the next best with pretty reasonable short-handed caps and an overall 5% rake structure. Chico is worse because of higher caps and rake percents. PaiWangLuo also doesn't compare to WPN because of its $4 cap at $50 and $100 full 6-handed and 9-handed games. Merge and Global between them take the “prize” for worst rake at these stakes. Global's shorthanded rakes are particularly bad because it doesn't give much of a discounted cap at all for hands with fewer than six participants. Merge meanwhile has a hefty $4 cap for longhanded play at all three stakes levels. This is the level where rake might start to matter a little less to some players and game selection, or even availability starts to become a factor. The mid stakes is where winning players tend to win much more money over time than they pay in rake, thus leaving behind the proverbial "rake trap" that players in the lower stakes are often faced with. Game availability also tends to suffer the higher up the ranks one goes. Thus the larger sites in this comparison will be the sites where one can find multiple games running, even at non-peak hours. The smaller sites one will often have difficulty finding games outside of peak times. Starting games is always an option, just be sure to pay attention to the heads up and three-handed rake levels if you happen to be a frequent game starter. WPN and Grand are best for game starters who enjoy short-handed play. Grand wins at $200, but WPN earns the crown at $400 and $600 games, at least in NL and PLO, because GPN doesn't offer Texas Hold'em or PLO-high big-bet games higher than $200. Yet, Grand is a place to consider for PLO/8 action if you're willing to table start because it does have split-pot PLO at these stakes. PaiWangLuo is also worth keeping on your radar, despite its slightly worse rake, because it's probably the best place to go to find games actually running at $200 and $400. At $600, Horizon is an option to consider, not because it's particularly attractive but because it's one of the few rooms to actually spread games at this unusual buyin value. Global and Merge are again the two worst rooms rakewise. Merge actually has $5 caps for $500-buyin NL and PLO when there are five or more players in a hand! High stakes poker players know that rake is not the biggest consideration when choosing a site to play at. Game selection becomes a much bigger issue at these stakes due to lack of steady round the clock action at any of the sites. At these stakes, it often makes sense for a high stakes pro to sign up at all available sites and cherry pick games as they are made available, or to simply start them oneself. With this said, it is still important to know if one is getting a good deal or not, and the chart above should be quite useful in helping you pick which sites to devote more action to. 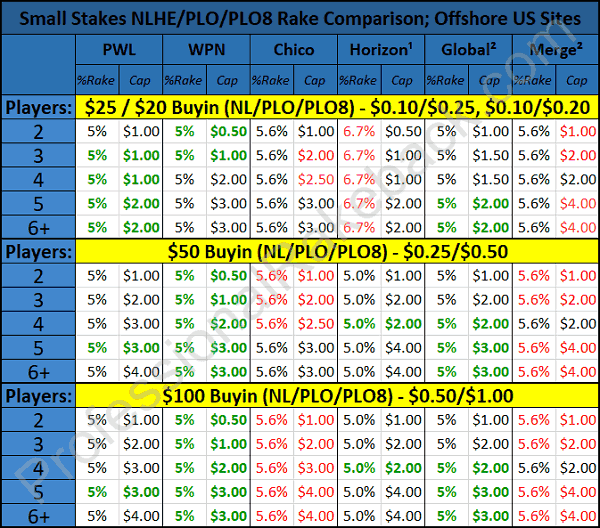 At the $1,000 level, the Winning Poker Network has the smallest rake, but PWL likely has more games. Chico has some tables running at this level too during most times of day. It's a similar story at $2,000 although you can play at Chico only for NLHE, not PLO or PLO-8. Horizon has tables at both of these stakes for all three big-bet formats, but you may not be able to find anyone else to play against at this small-volume network. At $5,000 buy-in, there is only one site in this list that offers tables, and that is Winning Poker Network. There tends to be 1-3 25/50 games that spark up each day, the trick is to catch them because they don't seem to run at consistent times. We recommend searching for them at peak Euro hours, peak US hours, and late night in the US, especially on weekends. Even though they have no competition at these stakes, WPN continues to offer a rake schedule that is superior to some other sites' small stakes fees! Merge doesn't even offer tables at $1,000 and higher while Global's rake chart is horrible for the short-handed play that you'll undoubtedly encounter at these stakes. 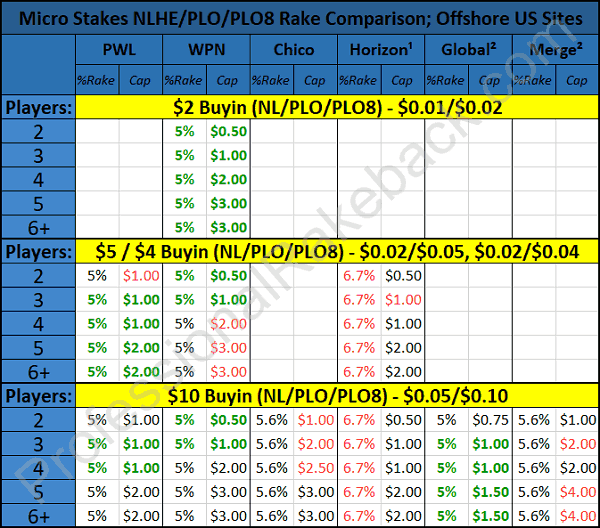 Chico Poker Network: Chico Network is slightly worse than average when it comes to cheap rake with a percentage across the board of 5.6%, higher than the normal 5%. Where it does shine is providing soft games with sports and casino punters. It also a decent initial deposit bonus of 100% up to $1,000! This bonus clears at a 20% effective rakeback rate, and it combines with the comp points program for a total of around 26% rakeback while the bonus is active. Chico Network also occasionally offers reload bonuses. If you also happen to play SNGs, they have a weekly $5,275 SNG race. If you want more info on Chico Sites, visit our full reviews for BetOnline, TigerGaming, and SportsbettingAG. PaiWangLuo Poker Network: The PaiWangLuo online poker organization has competitive rake at 5NL, 10NL, 25NL, 1000NL, and 2000NL. They also happen to be the largest option reviewed and the eighth largest network in the world. With anonymous games and no permanent player tracking, players who like to play GTO or highly exploitative Nemesis strategies will love practicing their arts on the soft and plentiful tables. Initial deposit bonus is 100% up to $1,000 and clears at 20% effective rakeback in cash games, and 30% effective in SNGs and multi-table tournaments. PWL Network is composed of Ignition Casino for US players and Aussies, Bovada for Americans who wish to bet on sports in addition to poker, Bodog for Canadians and Latin Americans, and Bodog88 for Asian players. If you want more info on PWL Network sites click the links above to read our reviews. Horizon Poker Network: After analyzing the rake charts we have provided in this report, you may have no desire to play on Horizon Network, especially considering they won no untied categories until the 1000NL limit. Yet, this is perhaps the best -raked site for PLO and PLO/8 at the $50, $100, and $200 buyins. Moreover, there are bonuses, rakeback, rake races, and other promotional offers to claim here. Horizon Network offers an industry standard deposit bonus of $1,000, but what isn't standard is that it is a 200% matching bonus, meaning that you only have to deposit $500 in order to max it out. It also clears at a surprisingly fast rate. If you have our industry-best 36% rakeback deal (using dealt methodology) then it clears at roughly 27%, and if you are on the VIP system (best for players raking more than $2,000 a month), clearance rates can exceed 50%. There are also weekly rake races for players amounting to $16,000 per month. With rakeback, the deposit and reload bonuses, a rake race, and a loyalty program, it’s a very profitable place to play, and the effective rake drops down to ultra-competitive levels. For more in-depth information on Horizon Network poker sites, visit our reviews for Intertops and Juicy Stakes. Winning Poker Network: This network has low rake compared to its competitors and that's a fact. The only downside to this low rake is that the games tend to be a bit tougher than at most other sites. Still, there are plenty of added benefits (described) below, and this is a very low-rake environment to grind in. Also, FWIW, the management at this site wants to become the next PokerStars (pre-Amaya) and are tirelessly working toward achieving that goal. WPN offers an initial deposit bonus of 100% up to $1,000 and frequently has reload bonuses that range in value from $200 to $1,000. All of these bonuses clear at 20%+ effective rakeback. There is a flat 27% rakeback offered on many of the skins on Winning Poker Network. This is optimal for lower stakes players as it guarantees a 27% rate of return. If you are a player who will rake less than $1,500 per month, we suggest opting for rakeback. If you fit into this category, we also suggest that you quickly read this WPN rakeback sites comparison guide and choose an appropriate skin for whatever country you reside in. Higher-stakes and higher-volume players, those raking in excess of $1,500 per month, should instead opt to be on the Elite Benefits rewards program. High stakes / high volume players can earn up to 70% rakeback on an annual basis using Elite Benefits VIP. In addition to rakeback and VIP rewards, there is also a weekly cash game rake race called “The Beast” that rewards 5 to 7 players per week with $2,500, twice that many with $1,000, and so on down the line. It's a huge boon to high-volume grinders. In fact, players who grind at Super Nova Elite level (old Stars players know what we're talking about) can earn upwards of $200,000 per year in VIP + Beast rewards! To read our full reviews of all of the aforementioned WPN poker rooms simply click any of the following links to said reviews: America's Cardroom, Black Chip Poker, True Poker. For native Spanish and Portuguese speaking players who wish to play on WPN, we suggest signing up on YaPoker. Grand Poker Network: Grand Poker Network is the all-out winner when it comes to finding a low-raked poker site. They consistently charge the lowest percentage of pots as well as having the lowest rake caps. It is a shame that this is also the smallest network reviewed and that their game selection rarely exceeds a dozen tables at any given time. However, if you like small and cozy sites with fast payouts, you should definitely look into this option. 5Dimes backs this network and they are well-known for offering discount sports betting and low-edge casino games; it's kinda their trademark. Thus, it's no wonder why they've positioned their poker product to also be so cheap. Grand Poker offers a huge rakeback deal of 50%. In addition, there are no-fee tournaments every day and a $500 freeroll every Sunday. It's amazing to us that with the lowest fee rake schedule and 50% effective rakeback, players aren't flocking to Grand Network. But it just goes to show that very few players are savvy like you, and few of them pay attention to the rake. We recommend GPN to anyone who likes to casually play, wants a site to play along side larger sites, likes to start games and play short-handed, as well as guys who bet sports and want access to their "reduced juice" book. For those seeking more information, please read our general Grand Poker Review. Global Poker: Global Poker has some pretty bad rake caps especially for play at tables with fewer than six people. 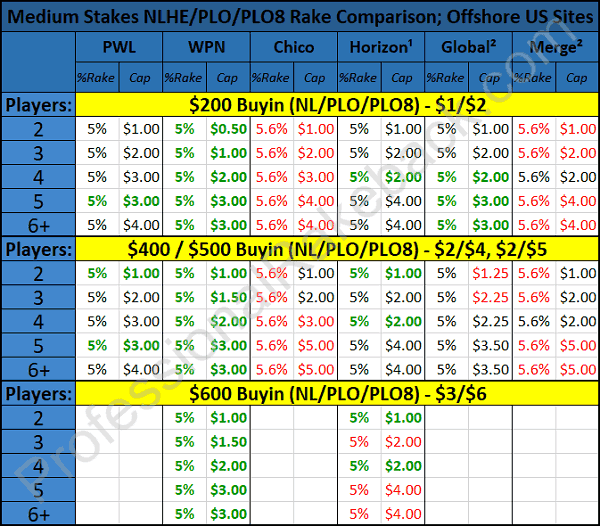 At the highest blind levels offered, Global actually takes out as much as $5.50 from each pot! 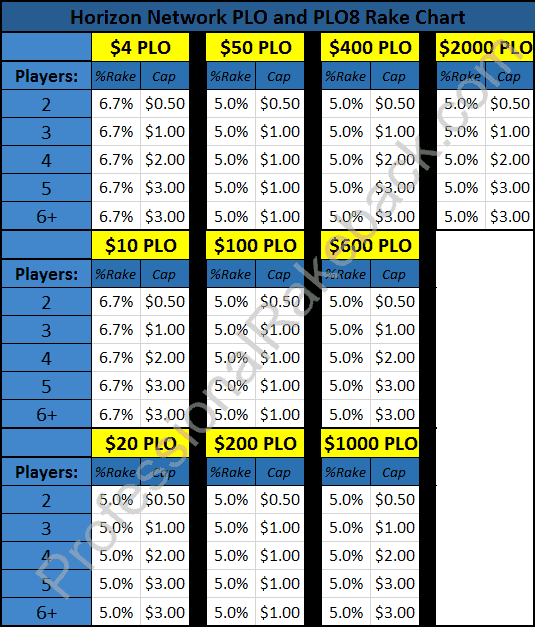 Whereas most other rooms give a substantial break for shorthanded play, all Global does is knock a paltry $0.50 off the caps for heads-up play – and even this ho-hum discount is not present at the lowest stakes. There's little other reason to make Global your internet poker home. It doesn't have any bonuses or rakeback. There's only a single method for deposits and withdrawals, and the site isn't compatible with third-party tracking tools. PLO/8 fans are out of luck because this format isn't supported. Global has opted to focus on recreational customers in its marketing and advertising efforts, and this is probably a wise decision for them because most knowledgeable players would rather head elsewhere. Unfortunately, these recreational users are getting a raw deal. Beyond the details we've just discussed for electing to take a pass on Global, there are also concerns with its business model, competence, and honesty. If you'd like to learn more about why don't recommend this site to our readers, check out our comprehensive Global Poker review. Merge Gaming Network: Consisting of Carbon Poker, PlayersOnly, Sportsbook.com and a few other minor skins, the Merge Gaming Network used to be one of the most popular online poker sites in the U.S.A. market. However, those days are long gone. In addition to taking a higher-than-average percentage of rake (5.6%), it also sports caps that go as high as $5. While Merge does have Fixed Limit Omaha-8, split-pot Omaha isn't spread in PL form. Moreover, there's little in the way of rewards beyond first deposit and redeposit bonuses. Merge has broken its promises to both players and affiliates before, and it even sometimes bans winners from its tables. To learn more about the significant problems at Carbon and the other Merge rooms, browse over to our Carbon Poker review. Everything is a bit of mixed bag and individual promotions and game softness need to be taken strongly into consideration when choosing a poker site. If you are basing your decision on what site to play at solely based off of the effective rake taken from each pot, then Grand Poker is the place to be although its low player traffic and limited range of stakes offered are drawbacks. The Winning Poker Network is very competitive at all levels, and it's the only site on our list that actually spreads games at every single stake level covered in all three variants (NLHE, PLO, and PLO/8). Small stakes PLO (hi and hi-lo) aficionados may prefer the Horizon Network and its low $1 rake cap at $50PLO, $100PLO, and $200PLO. When taking rakeback and bonuses into the consideration things get more complicated once again. Horizon becomes a serious candidate in all blind levels that it supports because its bonus and rakeback more than compensate for the fact that its rake structure is nothing special. The Winning Poker Network and Grand also have remunerative rakeback deals. PaiWangLuo and Chico tend to be around the middle of the pack as far as the amount of rake they charge. However, they are the two sites on our list with perhaps the softest games, and their rake schedules are by no means bad. Each of them also provides new players with a 100% up to $1,000 bonus. The Merge Network and Global Poker generally have the most unappealing rakes across the majority of the stakes/games that we've covered. This might be forgivable if these operators boasted a broad array of bonuses and promotions; however, this is sadly not the case. Merge doesn't reward players with anything much beyond welcome and reload bonuses, and Global doesn't even have any bonuses! If you want to receive the perks you deserve as a dedicated grinder, then avoid Merge Gaming and Global Poker. Rake considerations are sometimes challenging to talk about in some ways as each player is different and because of that we would encourage you to Skype us for a personal consultation so we can most appropriately guide you to what internet poker sites would work best for your particular playing habits. How does the rake work in poker? The rake is the portion of each pot that the house keeps for itself as a fee for providing the games. The rake is typically expressed in the form “X% up to Y.” X is the percentage of the pot that the house retains while Y is the maximum amount taken. It's usual for the rake structures to vary based on stake level and the variant of poker being played even at the same site. In tournaments and SNGs, the poker operator takes a tourney fee rather than a rake. Is rake taken out of every single pot? Although many pots are raked, it has become standard for some of them not to be. Generally speaking, hands that end preflop are not raked at all. Additionally, the rake is taken in specified increments, like $0.05 for every $1 in the pot. In this particular case, all pots smaller than $1 would be rake-free. Furthermore, uncalled bets are not raked. If someone makes a bet or raise and the opponent folds, ending the hand, then these final chips put into the pot are returned back to the bettor, and rake is taken only on the amount actually in the middle of the table. How are players' rake contributions calculated? It's sometimes hard to decide how rake paid should be credited to each player. For example, if nine players are dealt into a hand that winds up being raked $1.80, did each player pay $0.20 in rake? Or is it only players who actually put money into the pot who paid the rake? Perhaps it's only the winner of the hand who really paid because he or she would have ended up with the entire sum if there were no rake. Most poker sites use the weighted contributed formula to assign rake to the players. This methodology credits players with paying rake based upon the amount they contributed to a given pot. Not all poker rooms used the weighted contributed model. Intertops, which is listed in our charts above, employs dealt rake mechanisms instead. For more on the various rake attribution procedures in widespread use today, head over to our explanation of rake and rakeback calculation methods. Rakeback is a certain percentage of the rake automatically refunded to you at designated intervals. At some rooms, there's a minimum threshold that must be reached before any RB payment occurs. At others, you'll obtain whatever rakeback you've earned when the time for payment rolls around no matter how small it is. Almost all rakeback deals include tournament and sit-n-go fees within the total sum on which the RB is calculated. However, bonuses and other promotional winnings may be deducted from this total. If you have the option to play with rakeback but you elect not to exercise it, then you may be costing yourself hundreds or thousands of dollars per month. For more information about rakeback and to sign up at the best online poker rakeback sites, check out our list of RB offers.